There are some things that every mom, everywhere, wants for her kids. We all want our little ones to end up successful, with a great job and a loving family. We do our best as parents to raise them in a way that pushes them towards that goal and sets them up for success. We spend our lives trying to impart wisdom and values to them as they grow. Yet, there’s one principle that when taught, can have the greatest impact on their lives. Respect for oneself and others is the foundation on which a healthy and successful life is built. It’s also the hardest thing to teach and the area in which most mothers struggle, myself included. The roadblocks to learning respect are many. Especially in our “selfie” centered and inwardly focused society. With all we do for our kids these days it can leave them feeling a little bit entitled. Unfortunately, many a well meaning parent can end up giving their child too much freedom, or letting them get away with things, creating a shift in power that leaves them wondering who the real boss is around the house. Many parents can find themselves afraid to step in to correct their child for fear that their harshness will hurt them or cause them to feel unloved. With our world being as tough as it is, it can be easy for parents to allow their children to avoid discipline in favor of creating a safe place. Not to mention, kids want their way, regardless of what mom or dad says. Sometimes, working to raise a respectful kid will mean standing your ground and not backing down. With both parents often working in a household, those power struggles can be exhausting. Yet, parents having a healthy authority around the home is central to raising respectful kids. Whether it seems like it or not, your kids actually want you to be in charge! When you step in and do the hard work of leading and parenting them, it frees them up to just be a kid. Thankfully, there are a few steps you can take to keep your sanity and cause your kids to develop a more respectful disposition. Here are 7 tips for how to teach your child respect. The one thing your kid wants more than a new Xbox, junk food, or any other material possession, is your time and attention. In order for your children to see you as a healthy parental figure and worthy of their respect, they need to know that they can trust you and your love for them. Many an issue in your child’s behavior can be solved by spending quality time with them. Often times, bad behaviors are cries for attention. If your child starts to act out, stop and ask yourself if you have had enough one on one time with them lately, and if not, make it a priority after addressing the issue at hand. You should never tolerate disrespect from your kids in any fashion, but demanding respect without relationship, won’t get you to where you want to be. You are the one who sets the tone for the flow of energy in your home. Your children will learn to emulate the behaviors and actions they see you doing. Is your home filled with respectful relationships, or are there conflicts and bickering between family members? Do your best to make your interactions with your child as well as other family members ones that are marked with love and respect. Apologize when you mess up. Seek to listen and understand before responding. When you correct your child, make sure you do it from a place of calm, loving guidance.. Be careful to not have an attitude or sharp tone when you correct your child. There are times that call for a firm voice, but always try to stay aware of your own attitudes and behavior when you correct and discipline your child. Remember, they are learning how to treat others by how you treat them. When your child begins to act up, it’s easy to make it about yourself, rather than just dealing with the behavior. Maybe if you were a better mom, worked less, did more etc., your kid wouldn’t act the way they do. However, this line of reasoning is simply untrue, and renders us ineffective as parents. Kids will be kids, and will do things to test us, regardless of how well meaning and loving we are. We need to be ready for those times and when they come, deal with them from a place of peace and levelheadedness. Don’t take your child’s back talk to heart(do you remember telling your mom or dad that you hated them? Or at least muttering it just out of earshot). Express to them that talking to you in that sort of way won’t be tolerated, but don’t let it get under your skin. When your feelings get involved, you’re more likely to find yourself locked in a shouting match in which neither of you will emerge victorious. Your child should know which behaviors are and are not acceptable, both when they are with you and outside of the home. Set ground rules for how your child should behave and hold them to that standard. When your child becomes disrespectful or misbehaves, address the behavior and use corrective action. Have go-to consequences for when bad behavior arises. Some possible consequences are writing sentences, taking a time out, or losing the use of certain privileges. Decide based on what you think will work for your child individually. They should know that whenever they behave poorly, it will be dealt with, rather than swept under the rug. By far the hardest part of parenting is consistency. Setting boundaries and establishing consequences for your child is a healthy part of their development. Through this type of corrective discipline they learn that actions have consequences and they grow to develop respect for authority. Be ready for your child to test you to see if you really mean business and be prepared to enact your consequences regardless of your feelings in the moment. When your child starts to learn that you mean business, they will question you less and respect you more. Respect for the other person is a necessary component of every relationship, whether it be between siblings, a parent and child, or someone outside of the home. Have conversations with your children about how they can be respectful and kind to all of the people they come in contact with on a daily basis. Talk about how it feels to be the new kid or have to sit by yourself. Play out practical scenarios with your kids that show them steps they can take to make others feel better. Have conversations with your children about how certain behaviors make them feel. Teach empathy by asking them to try to understand what another child, teacher, or person might be feeling in certain situations. When you find yourself correcting your child, try to not only focus on their actions in the moment, but on how this lesson will impact them in the future. Beginning with the end in mind is a strategy that will help you come up with a parenting plan that gets you and your kids where you want to go. If you want to raise a child who is independent, begin to show them that they can do things for themselves. As hard as it may be to step back and let your kids try things on their own, the sense of accomplishment they feel when they do things for themselves will ultimately be better for them than if you stepped in to do it for them. Helping your kids develop a sense of respect for themselves as well as others is extremely important and one that we should strive to work towards daily! Check out this list of helpful articles and resources that can help you learn how to teach your child respect! 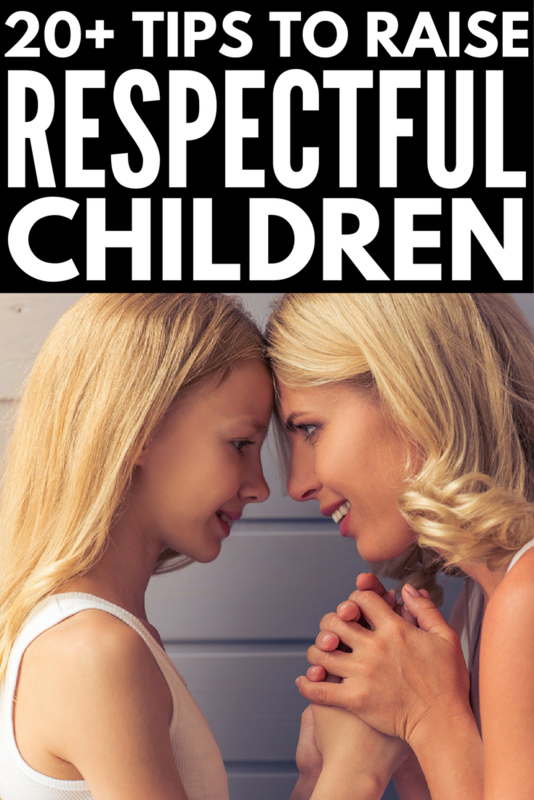 If you found this collection of tips to learn how to teach your kids respect, please share this post on Pinterest! And if you’re looking for more parenting advice, please follow our Parenting board where we share all kinds of fabulous tips and tricks we find each day!